Obituary for Raymond P. Corbett | Shore Point Funeral Home and Cremation Services, Inc.
Raymond P. Corbett, 88, of Tinton Falls, formerly Hazlet, NJ, son of Thomas Corbett and Ellen Tighe Corbett, sadly passed away on Wednesday, July 4, 2018. Born on March 15, 1930 in Glasgow, Scotland. Moved to Ireland until he emigrated to the US. They settled in the Bronx. He attended Cardinal Hayes HS and was a proud graduate of Manhattan College. It was in the Bronx that he met and married in 1955 the love of his life, Ann “Nancy” Farley, who preceded him to heaven five years ago. The fireworks in heaven were her doing to welcome him home. He proudly served four years in the Air Force, one year in Germany, one year in Wyoming and two years working for the Pentagon in Washington, DC. Ray and Nancy moved their young family to Hazlet, NJ, where he lived happily until he moved to the Seabrook community, Tinton Falls, a year ago. 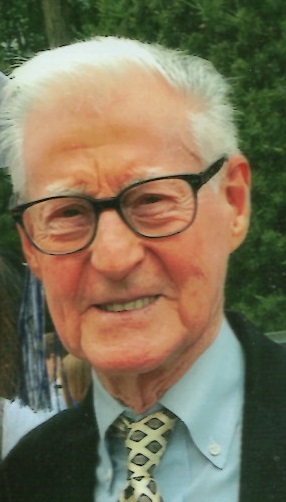 Ray was a faithful and longtime parishioner of the Holy Family parish, Union Beach, helping with numerous fundraisers over the years, including singing and dancing in shows, and ultimately founding the St Vincent de Paul Society and thrift shop, a charitable entity he served for nearly 40 years, even after his move to Seabrook. In 1988, because of his great works, he was awarded the Monmouth County Federation of the Holy Name Societies Man-of-the-Year. He was a devoted family man. No one was more important than his two sons Ray Jr. (Cathy), Mahwah; Tommy (Laura), Monmouth Beach; and his three daughters Shevaun (Steve) Selvin, Manhattan; Tracey (Tim) Riordan, Bernardsville; and Jeanne (Rich) Korchak, Fair Haven. Slightly more doted upon were his grandchildren: Michael, Scott and Keith Selvin, Matthew Keppler, Jack and Jesse Riordan, Kelley, Tommy and Courtney Corbett and Kate and Liam Korchak. He was a wonderful brother to his sister Eileen (Bob) Brittain, Hardy, VA. Besides Nancy and his parents, he was preceded in death by his sister Dolores. He was a fun-loving uncle to his many nieces and nephews. And because he always treated his friends like family, his life family went beyond the bonds of blood, and spanned many generations. He was an avid Met and Giant fan, always rooting them on through good and bad seasons. His friends and family will remember him best as a great man, great father, great uncle and great friend. He set the example of what it is to be a strong, kind person, of faith and integrity. Visitation will be held at the Shore Point Funeral Home, 3269 NJ-35, Hazlet, NJ on Monday, July 9, 2018 from 3-8 PM. A funeral mass to celebrate his life will be held on Tuesday, July 10, 2018 at 11:00 AM at Holy Family Roman Catholic Church, 727 NJ-36, Union Beach, NJ. In lieu of flowers, donations in Ray’s memory may be made to the St. Vincent de Paul Society, at Holy Family Roman Catholic Church, 727 NJ-36, Union Beach, NJ 07735. For information, directions, or to send condolences to the family, please visit, www.shorepointfh.com.